Alfalfa is not recommended as primary treatment for any condition, rather alfalfa is a tonic herb, one that supports health by nourishing the body. Alfalfa leaf contains a broad spectrum of nutrients, including considerable quantities of protein, trace mineral and vitamins, dietary fiber and chlorophyll, which serves as an antioxidant in the bloodstream. The deep root system absorbs minerals from the soil resulting in a plant rich in vitamins and minerals and a great source of fiber and protein. 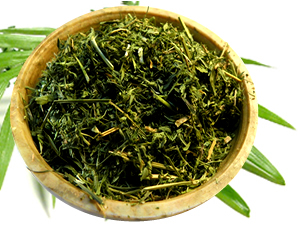 Alfalfa leaf is rich in protein and vitamins A, D, E, and K.
Alfalfa tea is mild and good tasting, and blends well with many other tonic herbs like nettle, mints, and citrus. Recipe Instructions: Herbal Tea :Use 1 to 2 teaspoons of dried alfalfa leaves in a cup of boiling water. Steep until cooled.